Enjoy a new kind of jump 'n run action, riding your bike on bumpy roads, crossing deep valleys and dodging all kinds of obstacles. Travel the globe to be the champion of the WORLD TOUR mode, or break the highscore in the endless GRAND PRIX mode and see how far you can go. Will you be able to collect all gold coins and unlock the special bonus stages? Just jump! 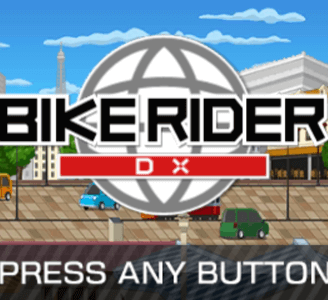 Bike Rider DX has some problems in Citra. Graphically, the game suffers from minor issues due to the lack of Geometry Shaders. It suffers from minor audio issues at times, but this does not hinder gameplay in any way.